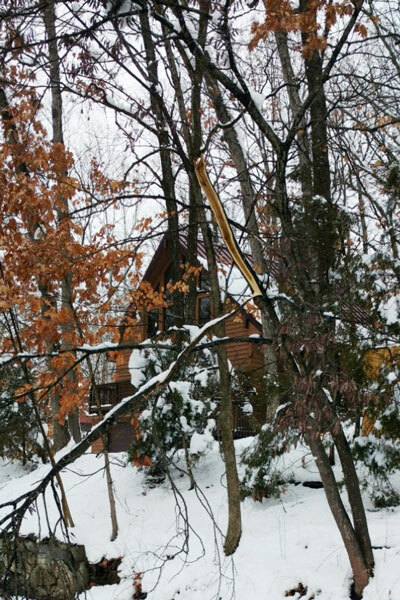 The recent snowstorm caused considerable damage to trees in Missouri landscapes. With the accumulation of wet heavy snow, tree leaning occurred, limbs broke, trunks split, and some trees were uprooted. Unlike typical ice storm damage, eastern red cedar and other evergreens with dense foliage were severely damaged by the weight of the snow (Figure 1). Bradford pear, eastern cottonwood, river birch, Siberian elm, and silver maple trees were also injured (Figure 2). Trees with coarse branching patterns generally experienced little injury, including Ohio buckeye, hickories, black walnut, bur oak, catalpa, ginkgo, horsechestnut, and Kentucky coffeetree. 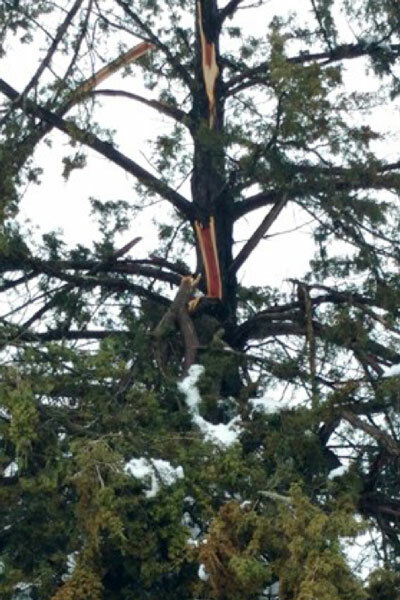 Figure 1 Exposed trunk of Eastern redcedar tree with broken tree limbs resulting from heavy wet snow. Figure 2 Damage to a tree trunk after sixteen inches of snow in early January 2019. Once broken limbs are cleared away, trees can be evaluated for their likelihood of survival. Even though trees may still be structurally sound, the remaining portion may not be aesthetically pleasing when re-growth occurs in the subsequent growing season, which may necessitate their removal. Tree replacement is a good option when 50% or more of the branches have fallen. Trees with completely exposed, broken root systems cannot be salvaged. Leaning trees with relatively small trunk diameter (less than 6 inches) without exposed root systems can be brought upright and securely fastened to three or more stakes to support the trunk. With leaning trees, it is difficult to assess underground root injury. These trees may recover during the growing season or can slowly decline and eventually die. In cases where the tree trunk split near the soil surface, there is a danger of subsequent disease infection. Fungi, such as Nectria or Leucostoma, can invade exposed wounds of fruit trees after winter injury, resulting in trunk and branch cankers. Ornamental trees can become infected with Phytophthora fungi or crown gall bacteria (Agrobacterium tumefaciens). Healthy ornamental trees with sufficient vigor can compartmentalize or wall off the injured tissue and will often produce callus tissue to overgrow the wound. The capacity of trees to compartmentalize wounds or decay varies by species. Although commercial tree wound products are available, they do not prevent further damage and are not recommended. 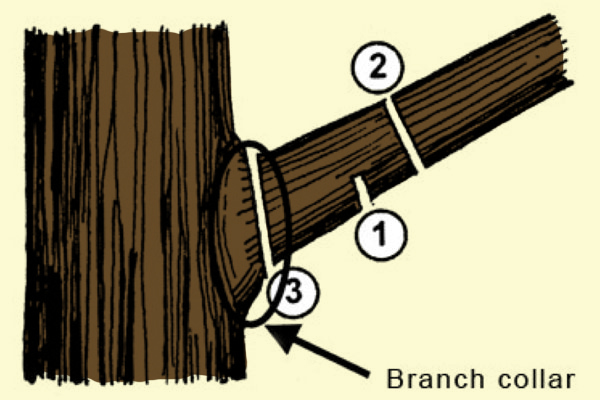 Figure 3 A three cut method for pruning large branches to prevent bark tearing on the main trunk. Broken branches and split limbs are removed by pruning. Small branches can be pruned back where they attach to a larger-diameter limb, avoiding stub cuts near the break. Large diameter branches should be pruned back to the trunk, using a three-cut approach to prevent bark tearing and further damage to the tree (Figure 3). The first cut is made about one-third of the way through the underside of the limb about four inches from the trunk. The second cut is made beyond the first one (about six inches from the trunk), starting from the top of the branch and completely removing the branch to remove its weight. The third cut is made nearest the trunk, but outside of the branch collar to promote healing. After broken limbs are removed, additional tree pruning can improve tree structure. Never "top" a tree or remove all the side branches, leaving only major limbs. This type pruning leads to a proliferation of new branches that quickly become overcrowded. When limbs have narrow crotch angles (less than 45° angles) from the trunk or between two limbs, they are structurally weak and prone to splitting. Trees such as Bradford pears are a good example of those with narrow crotch angles. Limbs with bark inclusions (i.e., bark growing between two branches) should also be removed during pruning. This next growing season, it will be important to irrigate damaged trees when moisture is deficient. The general rule of thumb is to supplement rainfall to one inch of water per week. A simple rain gauge can be used to estimate the amounts of rainfall and irrigation water applied. Mulching less than four inches deep in a ring around underneath the canopy and less than one inch deep near the trunk will help conserve soil moisture during periods of drought. Two or three light applications of granular nitrogen fertilizer from just before bud swell through June 30 can enhance tree recovery. Slow release fertilizers, such as Osmocote, provide a gradual release of nutrients favorable for growth. The amount of fertilizer applied is generally based on soil test results and tree size, with no more than a total of two pounds of actual nitrogen per 1,000 square feet during one season. Although some damaged trees must be removed, this presents an opportunity to re-design older landscapes with sturdy, well-adapted trees at proper spacings. Most tree care tags list their size at maturity and can be used as a guide when planting trees. Avoid placing trees underneath or near power lines, or too close to homes or other structures. Also make sure trees are selected that do not produce messy fruit, (female gingko, sweetgum, crabapple), nuts (black walnut), prickly burs (chestnut) or cones if you lack the time to pick them up. Although Bradford pear produces a multitude of beautiful flowers in early spring, these trees are not recommended for planting because of their tendency to produce upright branches with narrow crotch angles. In addition to their structural weakness, Bradford pear trees produce heavy crops of fruit with seeds that easily germinate and produce unwanted, invasive seedlings. While we await the outdoor growing season, now is a good time to browse University Extension guides, nursery catalogs, and websites to find suitable replacement trees for planting when temperatures become favorable.